The Earthquake 20015 Versa Front Tine Tiller is the best front tine tiller you can buy for the value it provides. It’s a task to keep your garden in good shape. Tilling can be a tough activity to do when you start preparing your garden for the growing season. The good old spade and shovel will only get you so far. It’s back-breaking work when you have a large plot of land to till. That’s where a front tine tiller can help you get the job done with little effort. So let’s look at the best front tine tiller you can buy for your garden. Do you need a front tine tiller? A tiller is a garden tool used for the purposes of moving the soil in your yard. Different types of machines can be called tillers. You should be able to tell right away if you’re using a front tine tiller based on its appearance. The tines of this type of tiller are located in front of its wheels. The tines are also situated underneath the engine. When in motion, the tines of this particular type of tiller will dig into the ground while also propelling the machine forward. Front tine tillers can handle several types of yard work, thus upping their versatility. The usually lighter machines known as cultivators are considered as tillers and then there are also the speedier vertical tine tillers and the more powerful rear tine tillers. What differentiates the front tine tillers from all those other machines is the quality of its work. They are more powerful than cultivators but not quite as strong as the rear tine tillers. Front tine tillers are easier to move around than their rear tine counterparts. If you’re looking for a heavy-duty tiller that can move rocky soil around, it’s best to go for a rear tine tiller. They can generate a lot more power to get such work done. But if you have a small garden that needs basic tilling to get it prepared, a front tine tiller works very well. It’s suitable for small to medium-sized gardens. Let’s look at some characteristics that will help you make the best buying decision for a front tine tiller. Front tine tillers are supposed to make the routine maintenance tasks that you need to complete for your yard easier. A front tine tiller won’t be able to accomplish that if it lacks the right tilling capabilities. For a front tine tiller, the acceptable range for maximum tilling width should fall somewhere between 12 to 24 inches. Some front tine tillers have adjustable tilling widths. The maximum tilling depth for a suitable front tine tiller should be between 6 to 8 inches. If you can find one that can go deeper than 8 inches, that’s even better. Front tine tillers rely on engines to power them through the soil and debris in your yard. 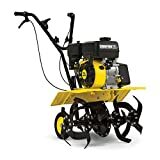 You need to pay close attention to what kind of engine has been installed on the front tine tiller to see if it will align better with your needs. When shopping for tillers, and really any kind of motorized machine, many folks tend to look at the cc rating and assign a great deal of importance to that. To be clear, the engine’s cc rating is important. Still, it is worth pointing out that a tiller having an engine with a higher cc rating does not necessarily mean that the machine will be able to work faster. There are other factors that determine how fast the machine can go. The cc rating does hint at the power potential of the engine though. An engine with a higher cc rating possesses the ability to produce greater power, but that will come at the cost of its fuel economy. 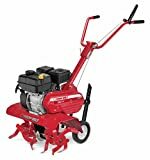 You will likely also have to choose from tillers that have either 2-cycle or 4-cycle engines. Generally speaking, 2-cycle engines are easier to start and maintain. The 4-cycle engines usually feature greater fuel economy. There is no right or wrong choice here. You just have to pick the one that better suits your needs and preferences. Weight is an important consideration when shopping for a new front tine tiller. Though these garden tools are generally easier to use than the rear tine tillers, you may still struggle if the machine you’re using is too heavy. Most front tine tillers weigh well over 100 pounds, but there are variants of this machine that don’t exceed that triple digit threshold. If you have a hard time working with heavy machinery, remember to look for those front tine tillers that are not too bulky. Tillers need to be stored properly if you want them to last for a long time. Some manufacturers have added features to their front tine tillers that will make them easier to put away. Foldable handles, easy-to-remove tines, and smaller wheels are among those features that will aid with easier storage. Homeowners that don’t have a ton of free space to spare will want the tillers that come with those features. Adjustable tillers are incredibly handy. The segments of the yard you’ll work over probably won’t all look the same way and it would be helpful to have a front tine tiller that can be easily adjusted to account for that. Front tine tillers that can work in reverse are also nice to have. Sometimes, you may pass over a patch of land by accident. Being able to just pull back the tiller to take care of that will save you precious time and energy. Modern front tine tillers have been designed to be extra safe for their users. You still have to follow precautionary measures if you want to further reduce the chances of an unfortunate accident taking place. First off, you will need to wear protective equipment. Safety goggles and shoes are absolute must-haves. Thick boots can be substituted for the safety shoes. It is recommended that you refrain from wearing loose-fitting pants or shirts while working. Such clothes could get tangled up in the tines. Before working, you should make sure that the yard is clear. Get rid of any toys that your kids may have left behind and also double check if your kids are inside together with your pets. You will also want to work away from any hoses or pipes that may be present in your yard. Check the tiller too. Examine the wheels, the blades, and the engine before you start so that no issues arise while you’re in the middle of your work. Prior to starting the tiller, you will want to get it calibrated first. Adjust the handlebars if needed and select the right working width and depth for your tiller. Next up, you will want to turn on the tiller. Some tillers may be activated in different ways so always read the manual first. For the most part though, turning a tiller on involves applying the choke, opening the throttle, and pulling on the starter. You will then have to open up the choke lever. You should let the tiller warm up for a bit. Once you’re ready to go, stick that stake installed on the back of the tiller into the ground and then open up the throttle. You must have that stake buried into the ground while working or else the front tine tiller may prove too difficult to control. That stake keeps the tiller stable. Keep a firm grip on the front tine tiller while it’s in use and repeatedly go over the soil you’re working on to make sure that it’s processed correctly. Front tine tiller maintenance begins with addressing the air filter and the oil that your machine uses. The air filter, in particular, is going to need your attention more frequently. Most air filters can remain useful for a total of 20 to 25 hours. Once you reach those limits, you will have to replace the air filter. The oil doesn’t need to be changed as quickly. According to How Stuff Works, the oil used in tillers can typically last for about 50 hours. Just make sure to keep tabs on that and make the change when the time comes. The tines will require some attention from you at some point as well. More often than not, the tines will only require a bit of cleaning and a little lubrication so that they can work fine again. If that’s not the case, then sharpening them is your next course of action. You may have to remove the tines before you can sharpen them. Remember to wear thick protective gloves before you start handling the sharp blades. Before putting the tiller in storage for the winter, you will want to let it run until the gas tank goes dry. If draining the gas tank is not an option, RepairClinic recommends getting a fuel stabilizer and using it in the tiller so that blockages do not form. The people over at Earthquake were able to create a tiller that could retain plenty of maneuverability while also featuring plenty of power. At just 85 pounds, the 20015 Versa Front Tine Tiller is one of the lightest of its kind. You will still need to exert a good amount of energy to get it going, but it’s more user-friendly than other front tine tillers. Tilling width is adjustable for this Earthquake creation. You can set that at 11, 16, or 21 inches. It also possesses the ability to go about 11 inches into the ground, which is quite impressive for a front tine tiller. The Versa is also equipped with a fuel-efficient engine. Because of the way the blades are designed, they tend to get caught up in weeds quite a bit. You can get through those obstacles with a stronger push through. The YT5238 Compact Front Tine Tiller features both adjustable tilling widths and tilling depths. For the widths, you can set it for 11, 16, or 21 inches. For the depths, it can be calibrated for 7 or 11 inches. The handlebars are also adjustable so that you can remain comfortable while using this machine. It may take you some time to get used to making those adjustments though. Even the machine itself can be difficult to assemble. Expect to spend a lot of time just putting this front tine tiller together. Once that’s out of the way, you should get hours upon hours of good work from this machine. The SFTT142 Front Tine Tiller from Southland is the type of machine that can be easily stored and transported. You can easily change the form of this tiller so that it becomes more portable. The wheels included also help with moving this tiller around from one place to another. Tilling widths are adjustable again for the same specifications, while the tilling depth maxes out at 11 inches. One issue you may encounter while using this tiller is related to how strong it vibrates. Because of how shaky it can be at times, keeping it under control may prove challenging. Just be extra careful when you’re using the full power of this tiller. The Champion front tine tiller can have a variable tilling width from 16 to 22 inches. The tilling depth you can reach is up to 8 inches. This helps you till for preparing the large areas of your garden and removing weeds from the rows. They come with 8-inch transport wheels that make it easy to move it around. It also increases balance and maneuverability in loose soil. The heavy-duty tines are made with hardened steel. They can help you till narrow as well as wide rows. The 212cc engine is powerful enough to till the soil for your small to medium sized garden. The Champion front tine tiller comes with a limited two-year warranty and lifetime technical support. The problem with this tiller is that it weighs about 119 lbs which makes it heavy to move around. The Troy-Bilt Colt front tine tiller comes with a powerful 208cc OHV 4-cycle engine. It comes with forward rotating Bolo tines that help to till as well as move the tiller ahead. The chain drive transmission is used for this forward motion. The tilling width is adjustable as 13, 22 and 24 inches. And the tilling depth can be adjusted up to 7 inches. You can fold the handle down so it gives you easy storage. The hand grip is comfortable so you can use the tiller for a long time without fatigue. The problem with this front tine tiller is it’s heavy weighing 128 lbs. And that also makes it difficult to use. 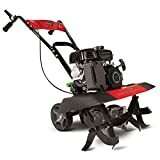 You should want a front tine tiller that manages to provide a decent amount of power along with good maneuverability and the item in this article that best fits that description is the 20015 Versa Front Tine Tiller from Earthquake. That Earthquake tiller manages to cram remarkable tilling capabilities into a relatively light package, which is why it gets the nod for best front tine tiller. It even outdoes other tillers in terms of digging depth. The tangling issue is minor at best and you should be able to quickly address it whenever it does pop up. The Versa Front Tine Tiller is suitable for yards small and medium-sized. If your yard is on the bigger though, you may find that the Colt Forward Rotating Front Tine Tiller from Troy-Bilt better fits your needs.